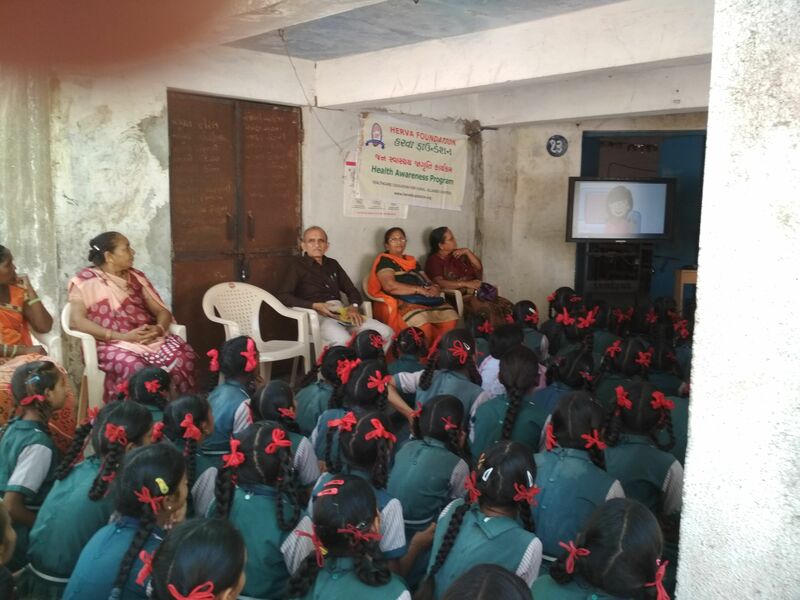 More than 80 girl students of standard 6 to 10 from primary to high school and village women attended. creating aspiration to do good in life. We have selected Kabbadi for boys and kho..kho for girls. 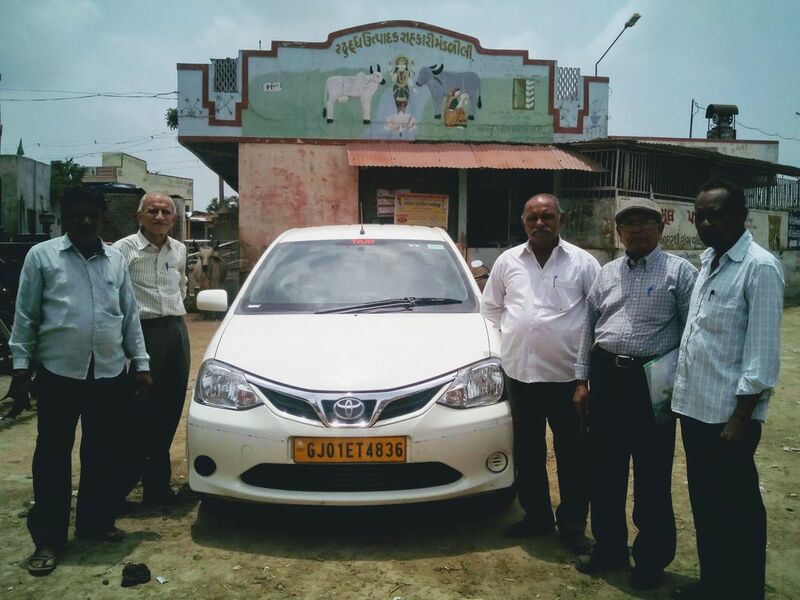 Shri Ashokbhai Deshpande retired coach and trainer of Sports society of Gujarat Government accompanied us to the villages to study the feasibility of the project. He had discussion with the school PT teacher and the students. He should them some exercise and yoga asanas to the boys and girls students. More than 25 students participated in this trial game.We are also planning to arrange tournament between players of Village Ghoda and Jalampura in January. The success in this villages can provide us the confidence to have the project in other villages. 162 villagers registered out this 85 were Male and 77 were female. 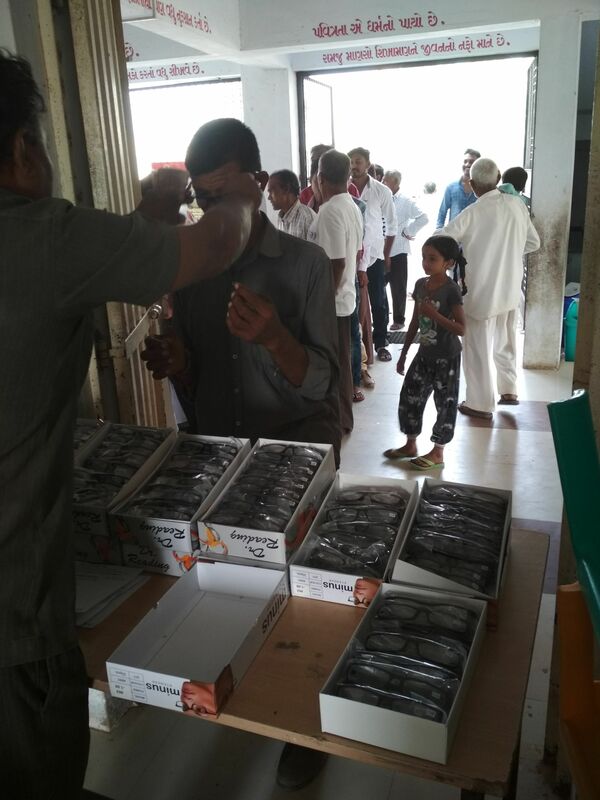 We have distributed 70 spectacles .11 patient was diagnosed having cataract..Out of 162 patient 22 senior citizens..out them 13 male and 7 female. We also thank Dr KK Patel And Dr DA Patel for spending their Sunday with us. 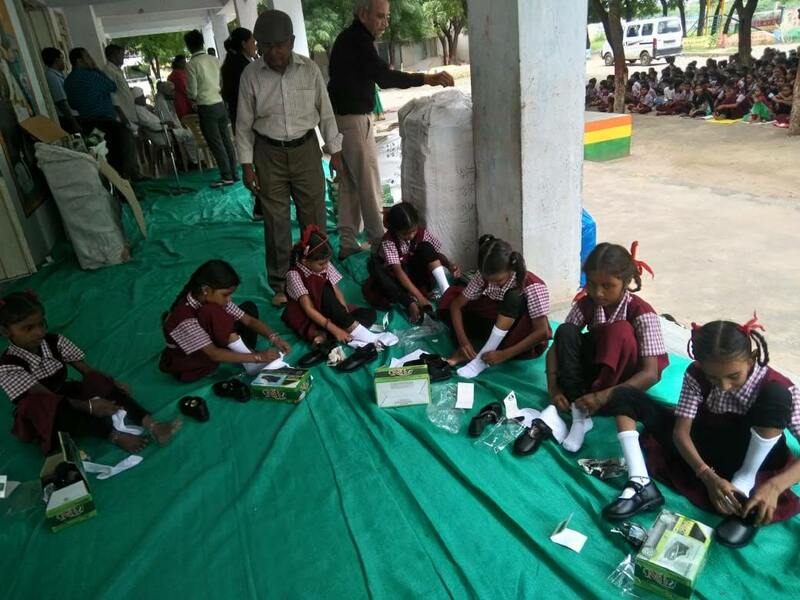 The idea behind this project is to teach cleanliness to the students with the help of their teachers as the earlier we impart such knowledge to the young minds they will follow it as they grow older. Shoes will also protect the small legs of the children from dirt and injury. HERVA FOUNDATION have been chosen to be part of the GAP Intensive ~ ( Global Action on Poverty). The Gap team visited us on 17th Nov 2017 and visited the two villages of Ghoda & Jalampura. It was decided to start the LIVELIHOOD PROGRAM at this two villages. The women in the villages who knew stitching will make cotton bags like the sample bags given to them . They will be paid for each bags they stitched. This will enable them to have an additional income. 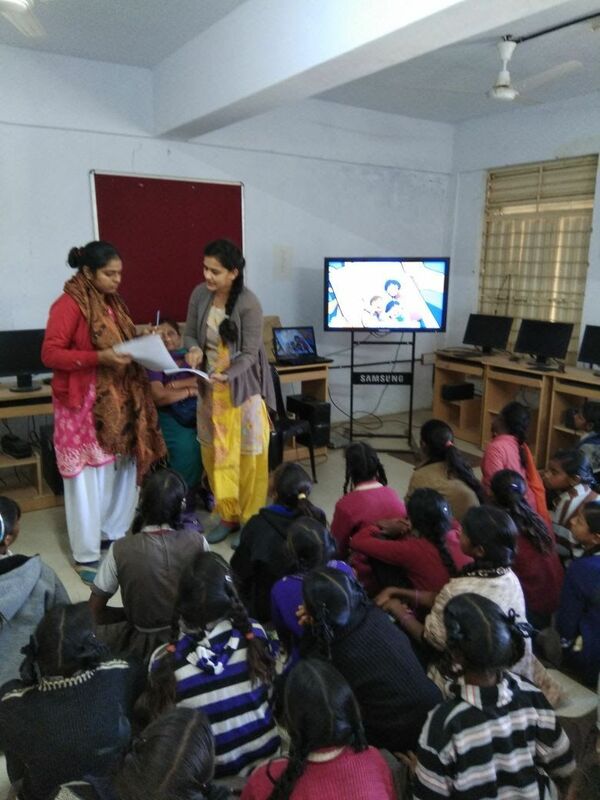 .Around 122 girls students and 14 ladies of the village took part. Lady Sarpanch Mrs Gangaben of the village remain present throughout the program. 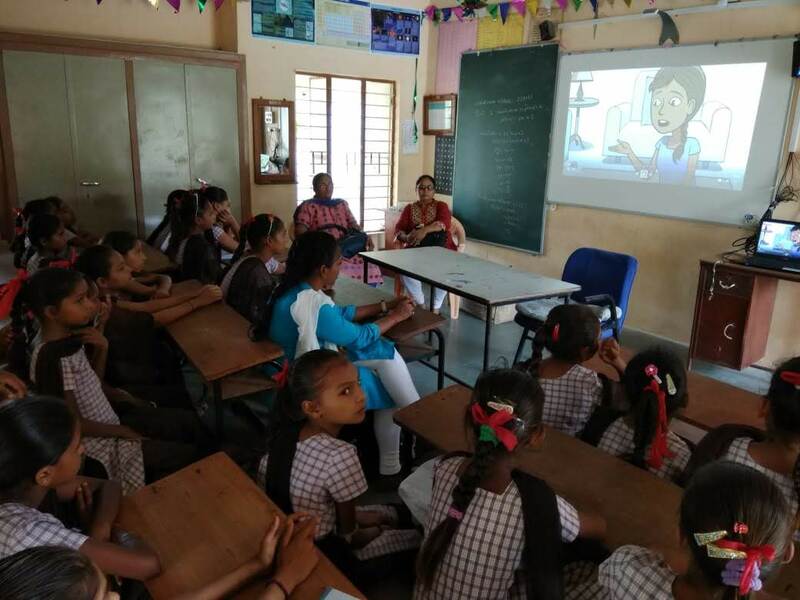 We screened comic video of Menstrupedia advising various ways to help young girls and women stay informed about their body and managing their periods effectively. We gave sanitary napkins to the girl students and other females, free of cost. We have also donated 10 books of Menstrupedia to school library for benefit of school girls and women of village. Principal Mrs.Deepaben and her staff gave us full cooperation. 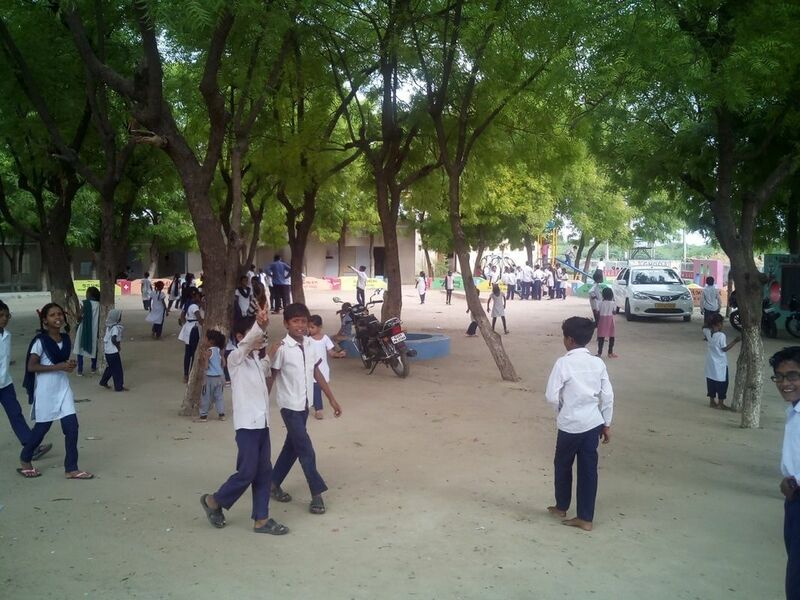 The students were also proactive and well behaved. 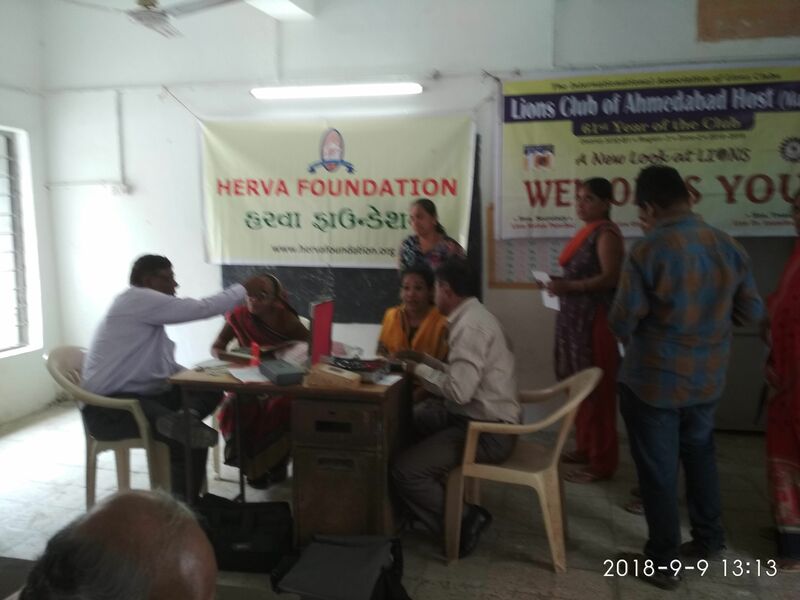 Successful Medical check up camp in association with NIMS Hospital at village Ghoda and Jalampura with free distribution of Medicine by Herva Foundation..165 village people has taken advantage of this of which 90 Male and 75 women..out of this 22 senior citizens. Also Swchhata abhiyan in this villages and donated Dustbins, Grooms,Bambo Grooms, Garbage bags,to Gram Panchayats so that they can keep village clean . We also had discussions with the villagers on the GAP initiated Livelihood program. The villagers specially of Jalampura showed keen interest in the program. 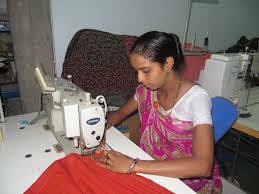 We have a list of 80 ladies of Jalampura who have given their names for learning stitching. Had a great day as we had been to two villages and had three activites on the same day at each village. 1) Rasikpura 2)Kaloli 3) Radhu 4) Varsang..in Kheda district..with the help of villagers..Sarpanch..& Talati. 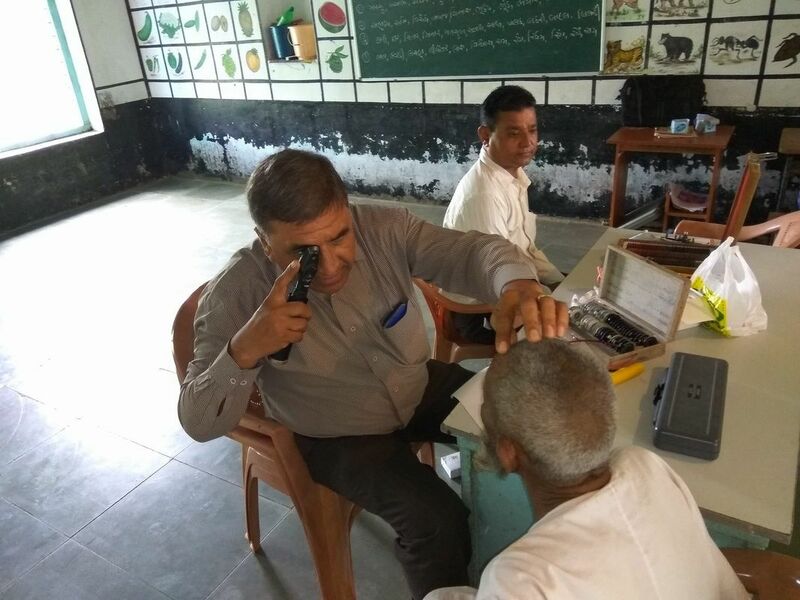 :Total 220 villagers attended the Eye Check up camp out of which 103 male and 117 women has checked..of which 46 senior citizen ( 26 male and 20 female ) 210 spectacles distributed to Villagers..Eight villagers are advised for cataract surgery. 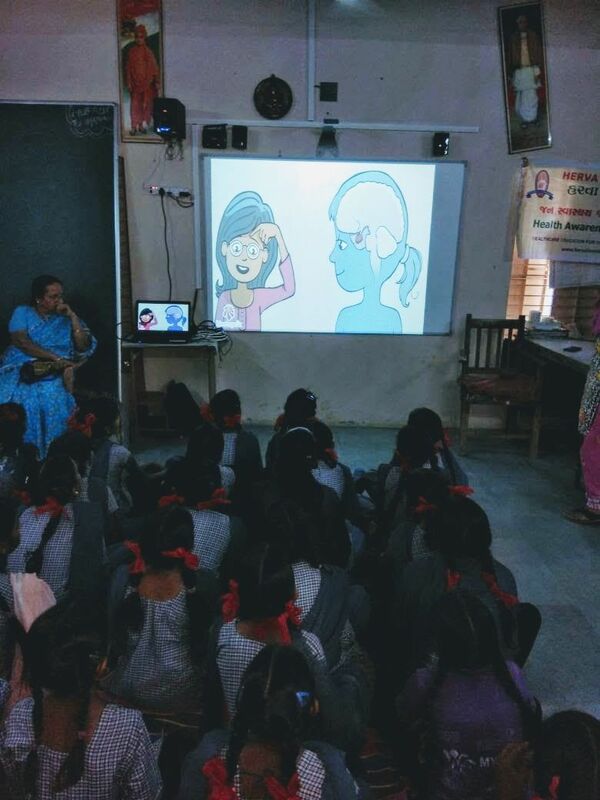 In women AWARENESS program we have screened comic video on Menstrual..65 girls and women taken part and interact with us..have distributed free sanitary pads to them. Total 220 villagers attended out of this 138 male and 82 female.out. 62 were senior citizens..of 43 male and 19 female..13 case recommend for cataract operation.. 182 spectacle given. Team of doctors were lead by Dr Chaturbhai. The sarpanch of the village was present and provided excellent support. 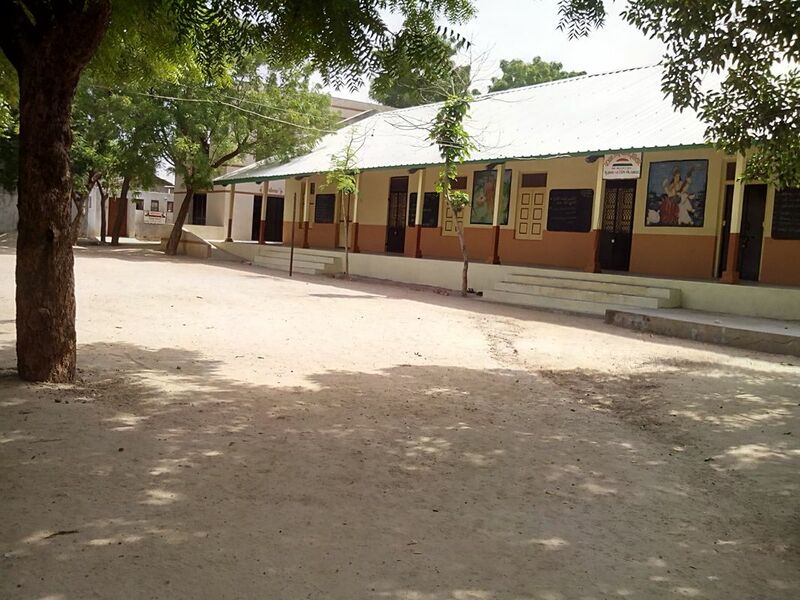 The camp was held at the primary school of the village. 104 Patients were screened. 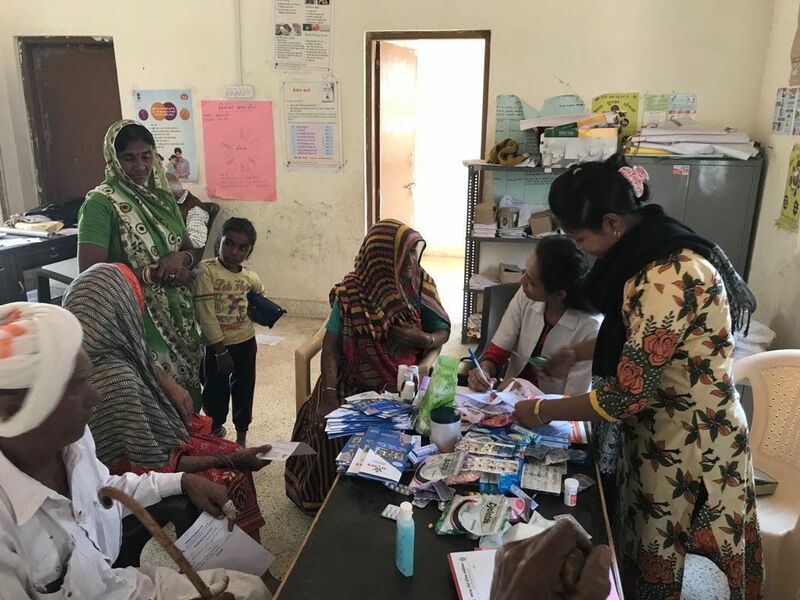 (about 38 female and 28 senior citizens) Majority of the Patients who turned up were found to be anaemic, Vitamin B12 and D3 deficiency, followed by body ache and lots of fungal Skin diseases. Around 6 persons were Frank diabetic. All of them were given counselling and further advice by doctors after basic Check up. All deserving Patients were given free appropriate medication. 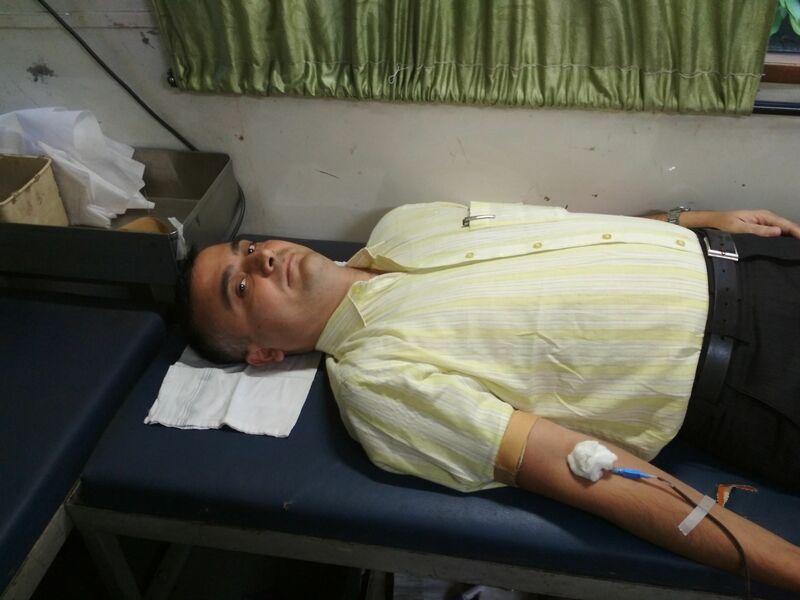 BP and diabetic check-up were also carried out. About 60 villagers took advantage of camp out of which were 34 male and 26 females,. Free checked and free medicines were provide. One hearing aid machine was given costing Rs 6000 as the person gave Rs4000/ cash. 3 other persons are also in need of hearing Aids. ROTARY CLUB OF AHMEDABAD NORTH joint us in this project. It was a very nicely spent Sunday afternoon. Three more villages are now added to the list of villages adopted. Rasikpura, Radhu, & Varsang villages are near Dholka in Kheda district . 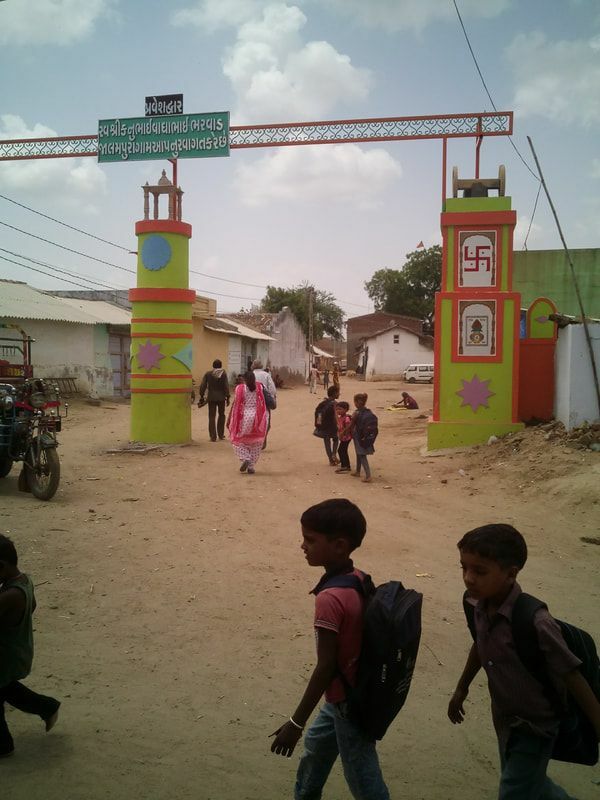 RASIKPURA village is located in Kheda Tehsil of Kheda district in Gujarat, India. It is situated 40km away from Nadiad, The total geographical area of village is 331.58 hectares. Rasikpura has a total population of 2,421 peoples. 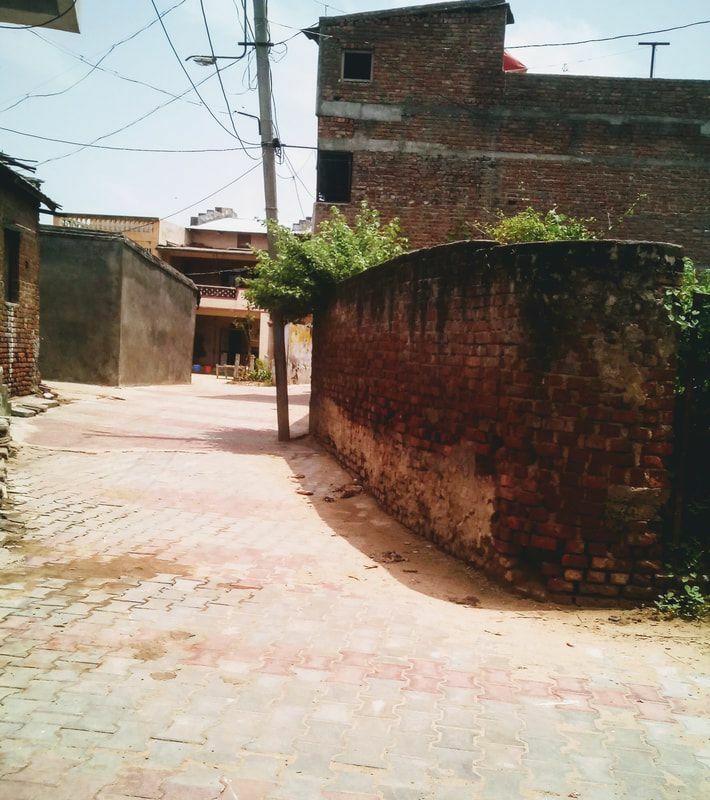 There are about 484 houses in Rasikpura village. Dholka is nearest town to Rasikpura which is approximately 8km away. Sarapanch : Shree Mukeshbhai Vaghela. RADHU village is located in Kheda Tehsil of Kheda district in Gujarat, India. It is situated 40km away from Nadiad, which is both district & sub-district headquarter of Radhu village. 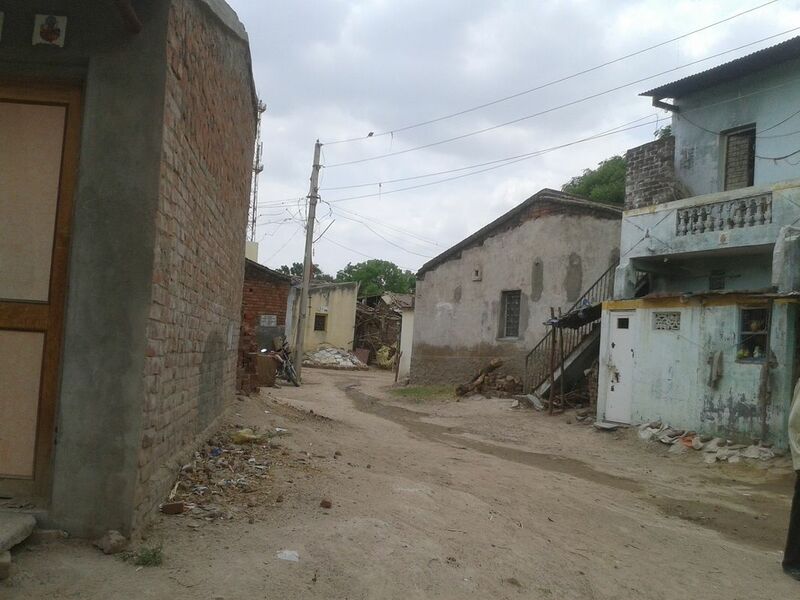 As per 2009 stats, there are about 2,072 houses in Radhu village with population of about 15000. Sarapanch :Smt.Gagaben Maganbhai Parmar. This place is well-known for its Shiv temple where people from abroad also are regulare visitors apart from the state. View its stock of ghee which does not get spoiled when kept in the temple premises. VARSANG is a Village in Kheda Taluka in Kheda District of Gujarat State, India.with a population 2200 It is located 18 KM towards west from District head quarters Kheda. Varsang Pin code is 387560 and postal head office is Radhu . Radhu ( 4 KM ) , Mahelaj ( 5 KM ) , Rasikpura ( 6 KM ) , Kharenti ( 6 KM ) are the nearby Villages to Varsang. 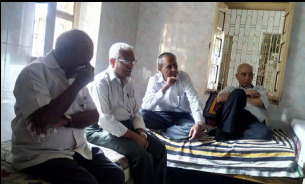 Varsang is surrounded by Kheda Taluka towards North , Dholka Taluka towards west..
Sarapanch : Smt Shitalben J Dodiya Principal of local school :Dineshbhai. Villagers of all age, specially senior citizens took advantage of the camp. Few were detected diabetes. They were advised to take necessary precautions. and women for skin & orthopaedic complains. Free homoeopathic medicines were given. The brother of Rtn. Ranjit Sinha, an audiologist checked approx 20 patients for hearing problem, of which ten had moderate to severe hearing problem. The camp was held in the village primary school. Our aim was to provide health service to the village senior citizens and the women folks of the village. We are happy that most of the women and senior citizens attended the came. Free sweets were distributed to the village children. Multi-diagnostic health check up and free medicine distribution camp was held on 12th April 2015 at Zanzarva village, in the campus of the local high school. The camp started at 11 in morning. 156 patients were screened by Dr. Prakash Vaishnav and Dr Sudha Parikh. 67 women.64 old male patient 25 children were given free medicines. Most of patients were suffering from arthritis, eye problems, Fever, acidity and skin problems. The Sarpanch of village also remained present on this occasion..
We whole heartedly thank Ashok Patel and his family for their support and organising this medical camp in their village of Zanzarva. Specially Askok',s Uncle and Aunty who were so much involved at such old age. This is lesson for us all. I also thank Dr Pahuja who spent the whole day with us, in spite his busy schedule and helped us. It was a team effort of all involved in our Herva Foundation to make this event a success. While the medical camp was on, the women's wing of Herva Foundation lead by Trustee Smt Neelaben Dave, took time off to meet and interact with the women of the village of Zanzarva. The women of the village gathered to hear the various programmes that have been planned for them, such as preparing ready to eat foodstuff, embroidery works, tailoring and such women empowerment schemes. The village women discussed their difficulties and wanted some time to think and discuss with their husband and other members. Our members also discussed about the health related education, cleanliness and neatness. Neelaben was supported by Saritaben Vaishnav and Kashmiraben Patel. We had a visit to Village Zanzarva to discuss various matters with the sarpanch and other members of the Village, specially regarding the Toilets in the village. ﻿About hundred application have been received for Toilets however the sarpanch Mr Sachin, states that on record with the government shows most of that they have toilets already built. He will be short listing the illegible villagers.﻿ We also discussed the adult education programme we intent to start in the village. They will be providing u with the list of interested villagers. The sarpanch was interested in the solar lights in the village. He will be providing the details of the requirements. We also had a meeting with sarpanch of village Rudatal near Zanzarva. The villagers are keen to have programs for women. We have given the survey form for getting the data of the village. Rudatal Village is in Detroj Rampura Taluka in Ahmadabad District of Gujarat State, India. It is located 74 KM towards west from District head quarters Ahmedabad. 10 KM from Detroj. 63 KM from State capital Gandhinagar . 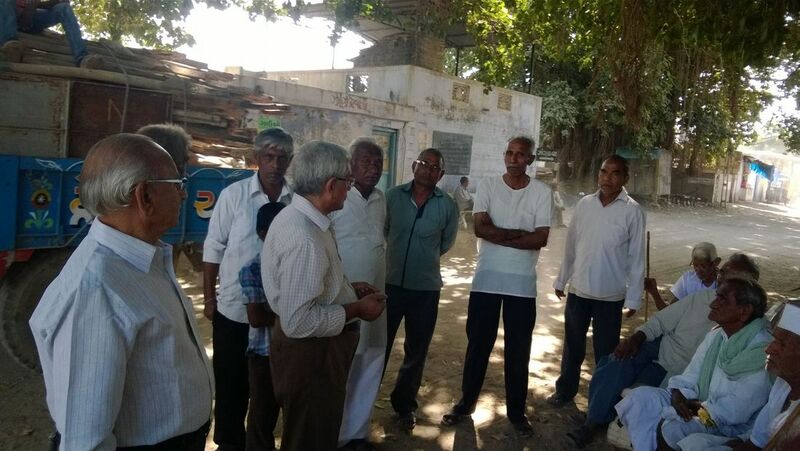 This village has been introduced to us by Mr Ramanbhai Patel a retired banker. We had a meeting with member of Panchayat at Asjol village with Pragatiben office from Jilla Vikas Kendra, who had completed survey of houses needing sanitation facility at the Village. 150 house have identified. With the help of Ex. 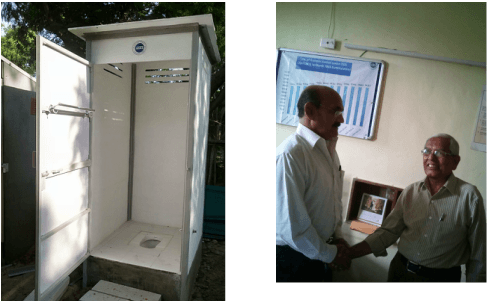 Sarpanch Mr. Nanjibhai of Village , we can start the construction off the Toilets in the village. 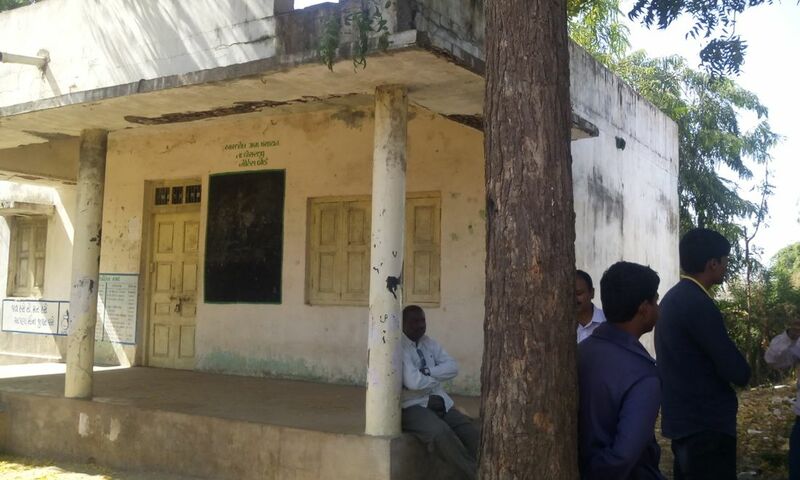 Virendra and Jigar along with the local youth of the village have taken the responsibility to mange the work at the village and keep us informed of the stages of work and coordinate with the Taluka office. For each toilet block Government would be giving Rs. 12000.00 directly to beneficiary account. We need to facilitate opening of the bank accounts of the villagers first. Villagers having less than eight viga of land and those having handicap person in the house will be getting Rs 12000/- for building the toilet. Others will get only Rs.4000/- from the government. We were also shown the place in the compound of the panchayat office of the village where we could install the RO plant. We visited the village with Mr Pranav Patel -who is to sett-up the RO plant at the village. He was shown the premise at the village panchayat office where the plant is to be setup. Since it is feasible to have the plant at the unused building, the village authorities will get the formalities completed at the earliest. We were also shown the place where we can have the computer training center which is planed for the village youth. Mahesh Patel who is having his training center at Bacheraji, will help to set up the center which can provide Government certificate to help the students to get employment easily. We intend to start with two computers. We also saw sanitary work at thee village. 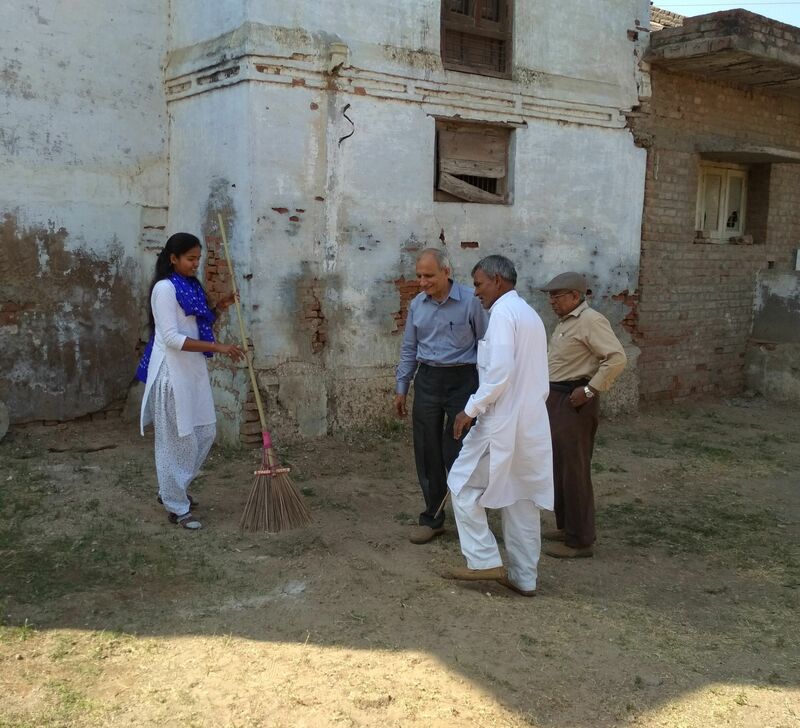 Four houses having disable persons have been selected to start the work for toilets. Soft-pits have been dug. We intend to complete toilets for 150 houses which have been identified by the concern authorities. Zanzarva is a small village in Mandal takula with a population of around 1000 people staying in the village. This is the 2nd village that we have adopted. 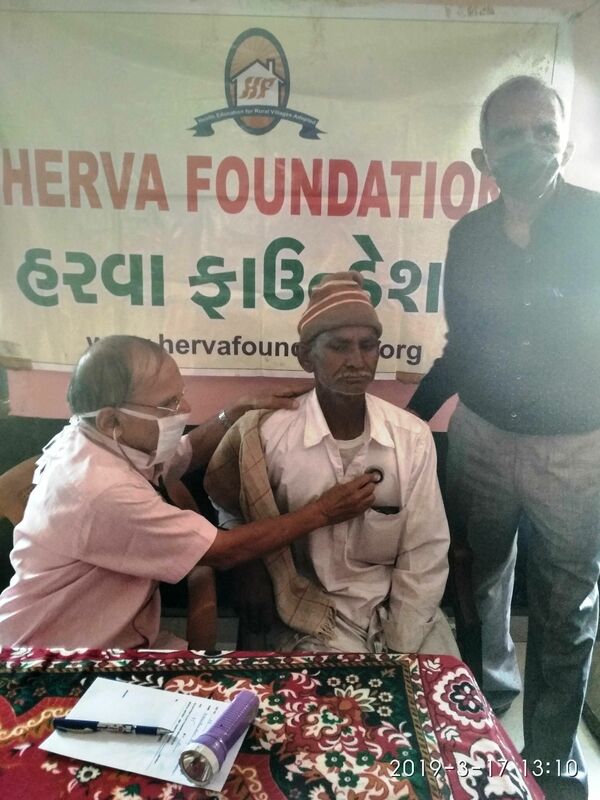 Kaloli Sarpanch is Mr. Pravinbhai S.Makwana.. aged man but very enthusiastic..The village needs Eye cam, women awareness, Diabetic camp, Toilet, Tree plantation. The Asjol is in Becharaji taluka and Mehsana district. It is about 24.86 KM from district Mehsana and 14.12 KM from taluka Becharaji. There are 12 small villages around Asjol depending on it. We intend to provide our service to these villages as well. To start with we shall take up villages within 5 kms radius of Asjol. 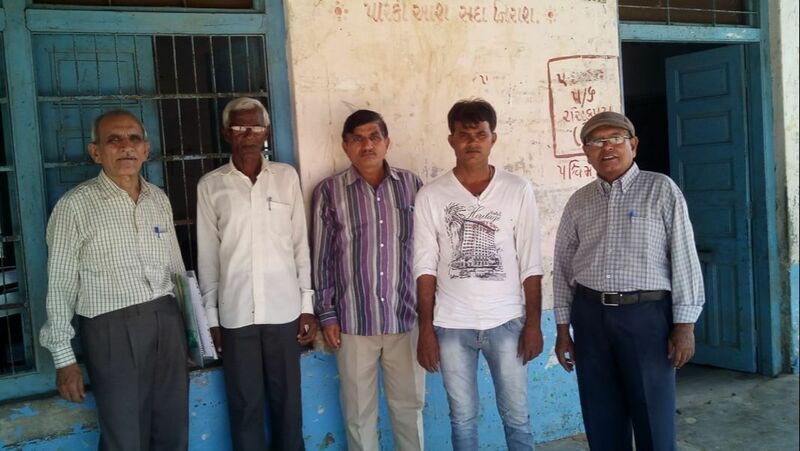 At present these villagers have to go to Mehsana, some 25 kms away,for their medical needs. We will be conducting a survey regarding the health and other basic needs of the villagers. From the ensuing results, a systematic record of the basic details of the health profile of the villagers will be prepared. The requirements of each village will be assessed and accordingly priorities will be worked out and based on the report of the survey the project will be commenced. Location: 90 km from Ahmedabad . 4 private non qualified practitioners. 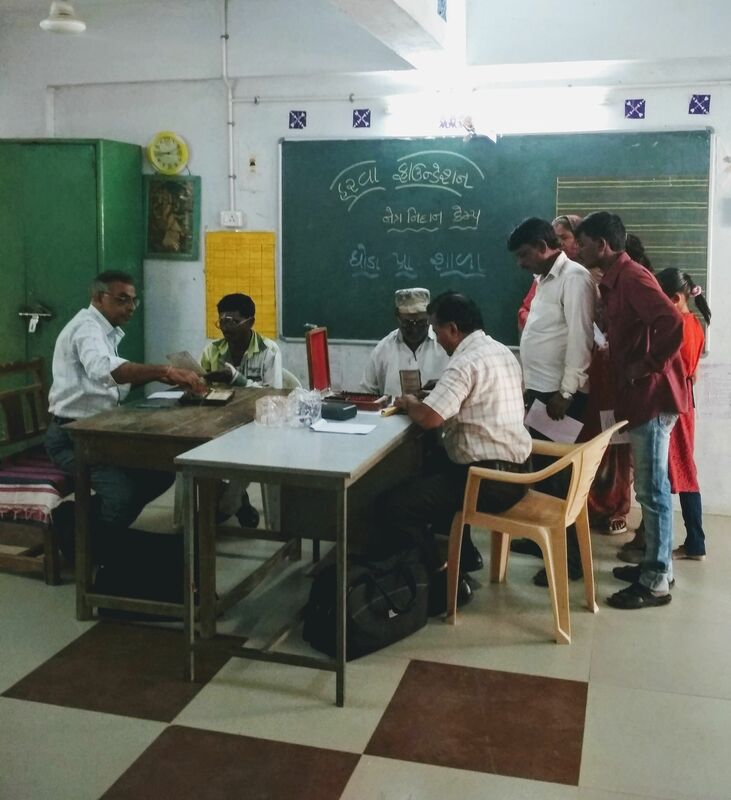 · Government workers from door to door for vaccination and people are accepting it. · Average medicine cost per day in village Rs 100. 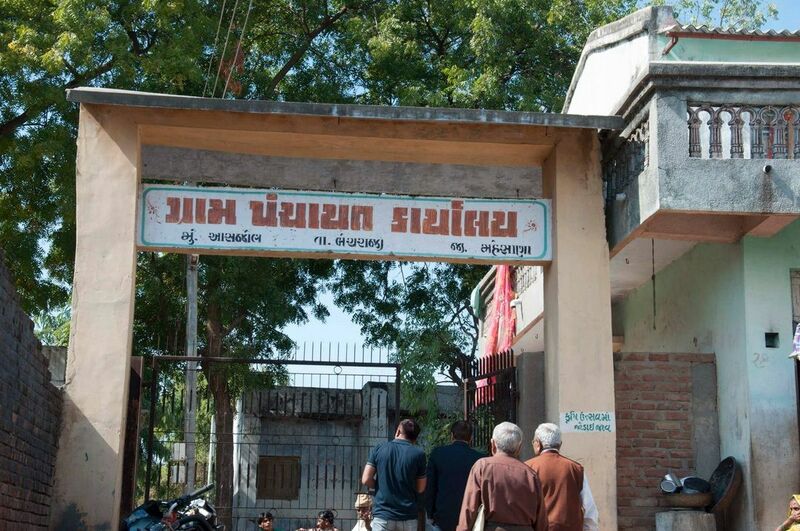 · Spending about Rs.1000 per visit to Mehsana for treatment. · Drinking water from borewell. The villagers have offered a place with proper roof and good structure, where we will keep the medical equipments and gadgets. We have tested the drinking water of the village and found the TDL level to be at a rate of 1380 PPM. Hence we need to provide RO-plant first. We are discussing with a company for setting up RO plant for drinking water with the capacity of 1500 LPH with ATM facility. A family can get maximum of 20 litres of drinking water every day on swiping the card. We had an eye-camp at the village on 29th of Nov 2014. Mainly women and senior citizens took advantage of the eye-camp. We distributed 304 spectacles, identified nine cataract patients and found a young boy almost blind. Multi-diagnostic health check up and free medicine distribution camp was held on 12th April 2015 at Zanzarva village, in the campus of the local high school. The camp started at 11 in morning. 156 patients were screened by Dr. Prakash Vaishnav and Dr Sudha Parikh. 67 women.64 old male patient 25 children were given free medicines. Most of patients were suffering from arthritis, eye problems, Fever, acidity and skin problems. The Sarpanch of village also remained present on this occasion. The villagers are keen to have programs for women. We have given the survey form for getting the data of the village. Most of the women in this village do not have basic education and hence we discussed with the village sarpanch to nominate two educated persons from the village to be given training at TCS with whom we are associated for literacy programme for rural village. We will be focussing on this aspect in this village. 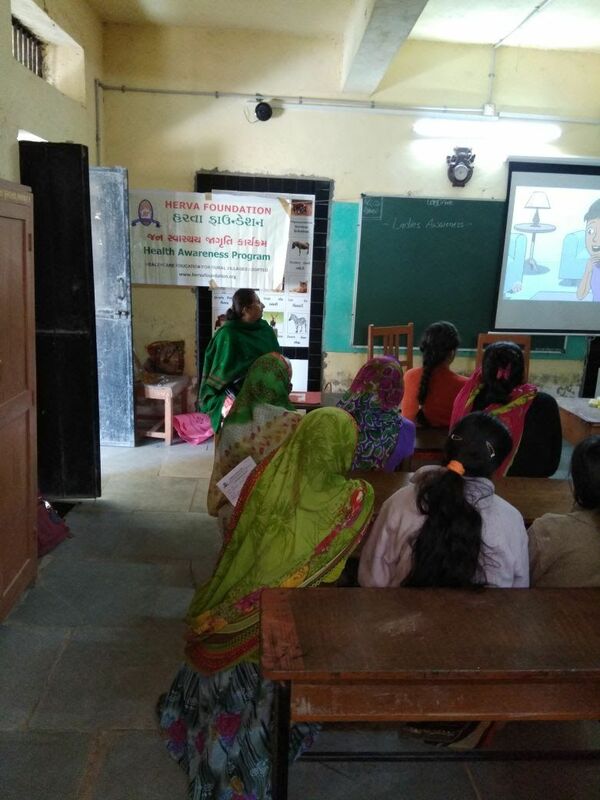 The health awareness camp for women in village was a first of this kind, with a aim to educate women on various health problems faced by women specially related to menstrual management. 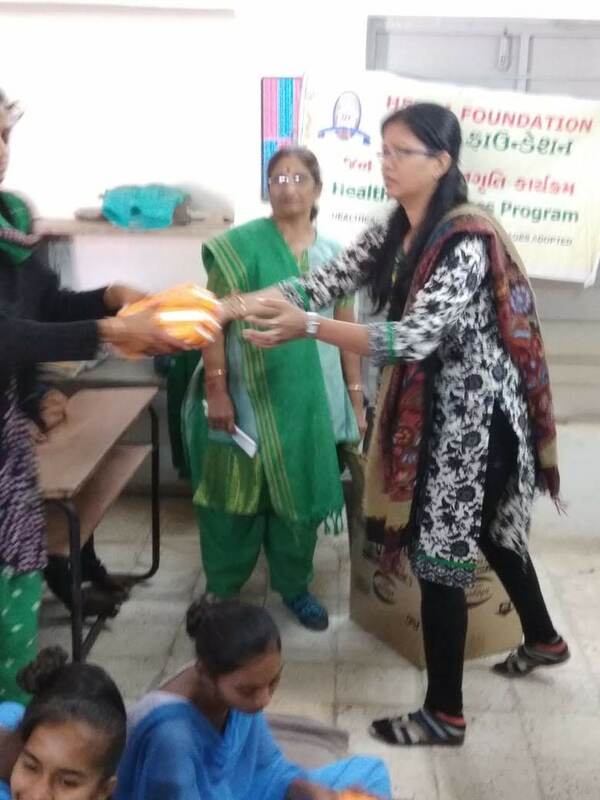 We distributed free sanitary pads to participants. 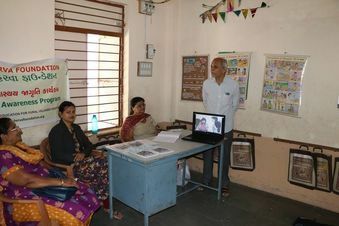 The educator is our experience Dr Prakash Vaishnav and the coordinator of the project is Mrs Neela Dave and her ladies group. We will be doing this in various villages. More than 200 registration registered in the camp. 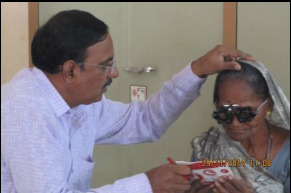 From kids to age 70 years got registered , the one who required were provided with spectacles. 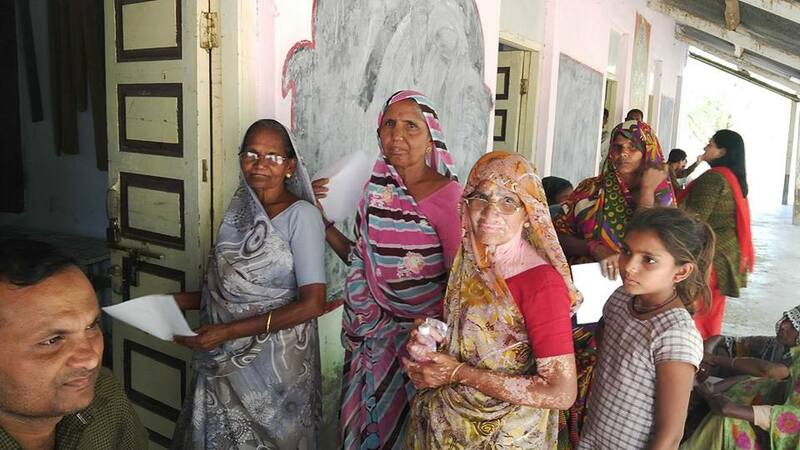 The ladies and the senior citizens , were benefited most as they normally do not go out of the village. The sarpanch of the village gave good support. VISIT GALLERY FOR PHOTOS. ﻿This camp was jointly with Rotary club of Ahmedabad North. There were more than 300 villagers who turned up for the camp and were given medicine free of cost. Most cases were pediatric, and ladies who were attended by our Rtn. Prakash Vaishnav. 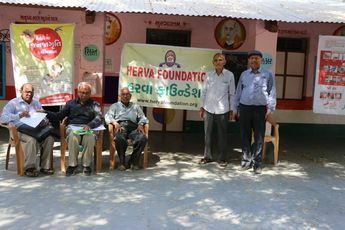 Two senior doctors, Dr. Nayak and Dr. Barrot from Kalol had participated in this camp. Dr. Sukan Mankand ,homoeopathic doctor helped men and women for skin & orthopaedic complains. Free homoeopathic medicines were given. The brother of Rtn. Ranjit Sinha, an audiologist checked approx 20 patients for hearing problem, of which ten had moderate to severe hearing problem. 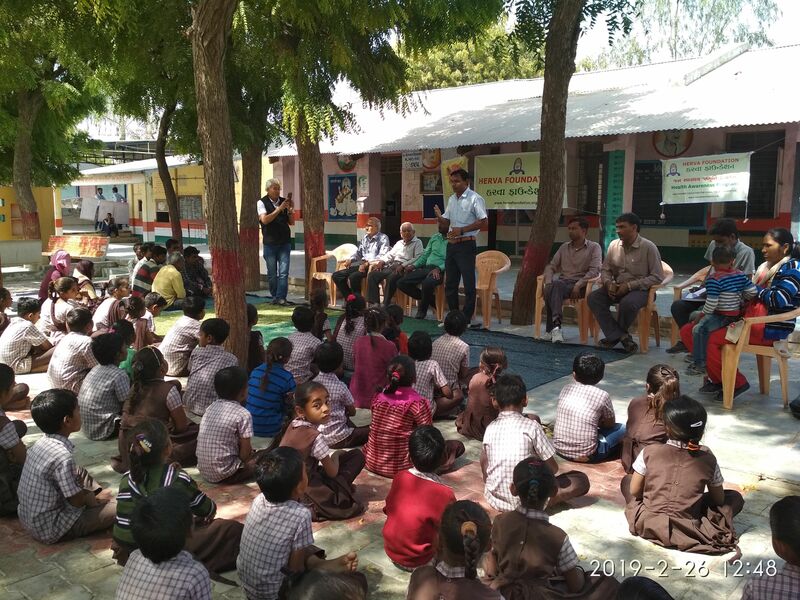 The camp was held in the village primary school. Free sweets were distributed to the village children. VISIT GALLERY FOR PHOTOS. Viramgam , Sanand , Dholka , Kadi are the near by Cities to Ghoda. Radhu village, with population of 15000, is located in Kheda Tehsil of Kheda district in Gujarat,. It is situated 40km away from Nadiad, which is both district & sub-district headquarters of Radhu village. As per 2009 stats, there are about 2,072 houses in Radhu village. Sarapanch : Shree Mukeshbhai Vaghela. Varsang Pin code is 387560 and postal head office is Radhu. 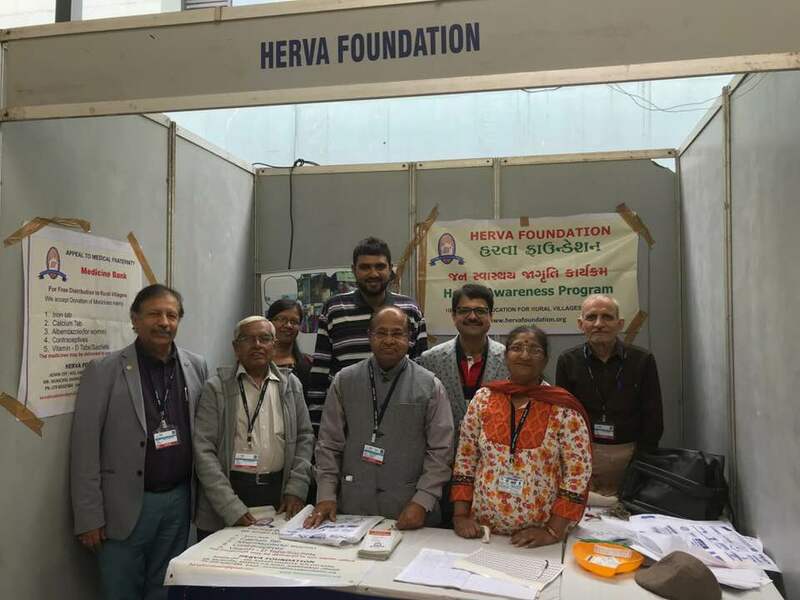 HERVA FOUNDATION AS RURAL PARTNERS. -a separate counter at the conference. 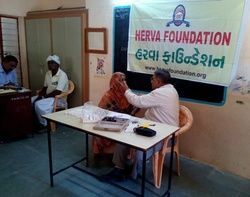 HERVA FOUNDATION INDEBTED TO THE MEDICAL FRATERNITY TO HELP ACHIEVE OUR OBJECTIVE OF BRINGING HEALTH CARE & HEALTH AWARENESS TO THE VILLAGE DOORSTEPS.